Take your Monday. Chop it into just-about bite-sized pieces. Skewer them. Throw them over hot coals (or in your broiler if you’re feeling particularly malicious.) 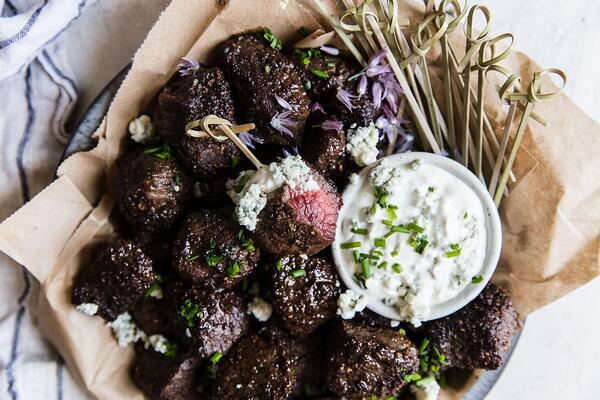 Watch those Monday pieces sizzle and sear, flare-up and smoke.This is the revenge you will exact on Monday when you choose to make these steak bites. This is putting Monday back in its place and making life good again. This will be dinner. In a small bowl, combine the garlic powder, pepper, onion powder and salt. Pat dry the steak bites and roll into the dry rub, being sure each bite is fully coated. Mix all the ingredients for the dressing in a small bowl, set aside. Heat the olive oil in a large skillet over high heat until smoking. Place half of the meat in the pan in a single layer. It should sizzle loudly when it hits the pan. Don’t stir or turn the meat for 30 to 45 seconds. When one side of the meat is browned, turn each piece with a pair of tongs. Cook each side for an additional 30 to 45 seconds – just long enough to sear the outside of the meat. Repeat the process with the second package of meat. When the steak is finished cooking, transfer it to a serving plate along with toothpicks and blue cheese dipping sauce. Enjoy and eat life to the fullest!